Colorblocking remains a hot trend for summer but one color combination has me especially intrigued. Taking a cue from your favorite spa drinks, bright blue(berry) and vivid lime pair up for a splashy combination that is refreshingly smart and summer-ready tart. In this case the blue is the neutral. It is pops with a hint (or a shout) of lime. By mixing in accessories, it is a great way to add this colorful trend without overhauling your wardrobe. The clutch with a staple skinny and tee; the colorblock dress with a glimmering gold sandal? All perfect execution of this fruitful trend. What do you say, will you mix the lime with the blueberry this season? 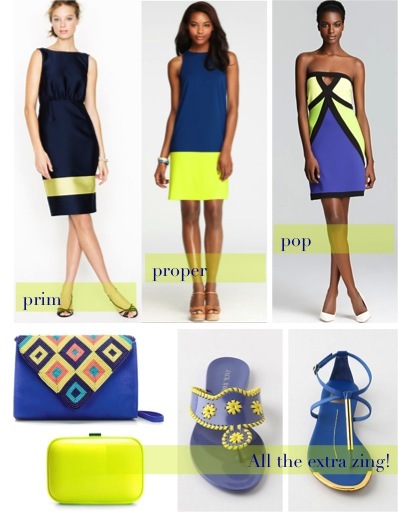 This entry was posted in Fashion Inspiration, Her Closet, Shopping and tagged blue and green, blue and lime, bright accessories, colorblock trend, lime accessories, looks for less, summer trends. Bookmark the permalink.